Before Jewel Zimmer founded Juna, a boutique cannabis company based in northern California, she was a fine dining pastry chef working in the kitchens of renowned restaurants such as La Folie in San Fransisco and CityZen in Washington, D.C. While the transition from a pastry chef to an entrepreneur in the cannabis industry might seem like a surprising one, it's her background in the kitchen that helps set her inspired line of tinctures apart from the other CBD and THC products on the shelf. Zimmer brings the same mindful farm-to-table approach to crafting Juna's products that she did to preparing fine desserts. "Because of my culinary background, I understand the power of the source; it's paramount," the entrepreneur tells MyDomaine. "Any good product starts with the raw ingredients, and we here at Juna essentially become partners of sorts with nature, farmers, and science," she explains. "Living in northern California is fortuitous, as we have access to some of the best sun-grown cannabis flower in the world." In this installment of Second Life, the founder of Juna reveals how she made the transition from being a fine dining pastry chef to founding a farm-to-table cannabis company, including developing a relationship with the controversial plant, combating stigmas and stereotypes surrounding the compound, and pushing past the fear of change to follow her own path. I was a fine dining pastry chef. I moved to San Francisco in the late '90s via a job offer at La Folie straight out of culinary school. It was the dot-com boom, and chefs were being looked at in a way that they had never been before—like celebrities almost. In my first few months of working there, I cooked for Ruth Reichl, editor at Gourmet, and I made a birthday cake for Julia Child. My introduction to the world of fine dining helped shape the way I thought not only food but everything I involved myself in—with immense sensitivity and nuance. There was a moment a couple years into my career where I stepped away from the food world and worked at International Orange Spa. It was when I was there that I studied shiatsu massage and Chinese herbs. I began to gain a strong affinity to beauty and wellness, and I was able to work alongside some amazing women such as Julie Elliott, the founder and creatrix of In Fiore, who inspires me to this day. I actually thought I was going to pivot into the beauty and wellness space permanently until I was offered an opportunity to be Eric Ziebold's pastry chef in Washington, D.C. He had been the chef de cuisine at the French Laundry for many years, and I knew the opportunity was one I should not let slip. How did you make the transition from cooking as a fine-dining pastry chef to starting a cannabis company? After I left the restaurant world, I launched a chocolate collection called Cocoa Absolute. Absolute, because I extracted the purest form of cacao's botanical actives and then infused them back into the chocolate. This included cacao's naturally occurring mood enhancers, polyphenol antioxidants, and anandamide, the feel-good (or Sanskrit translation "bliss") molecule found in chocolate that gives the feeling of euphoria. Coincidentally, I have come to find out that anandamide is a cannabinoid. I had a cult following and sold from here to Japan at small boutiques and larger outlets such as Barneys New York, Neiman Marcus, and Dean and Deluca. Cocoa Absolute was one of the first foods to enter into the beauty/adaptogen category, and this was back in 2009. Tell us about your current career path and business. I am the founder of Juna, a cannabis and hemp company based in San Francisco. It's very much a continuation of what I was doing with chocolate—extracting all of the benefits and botanical actives from the plant and creating approachable formulas for people to microdose within the form of drops or, sublingually, tinctures. 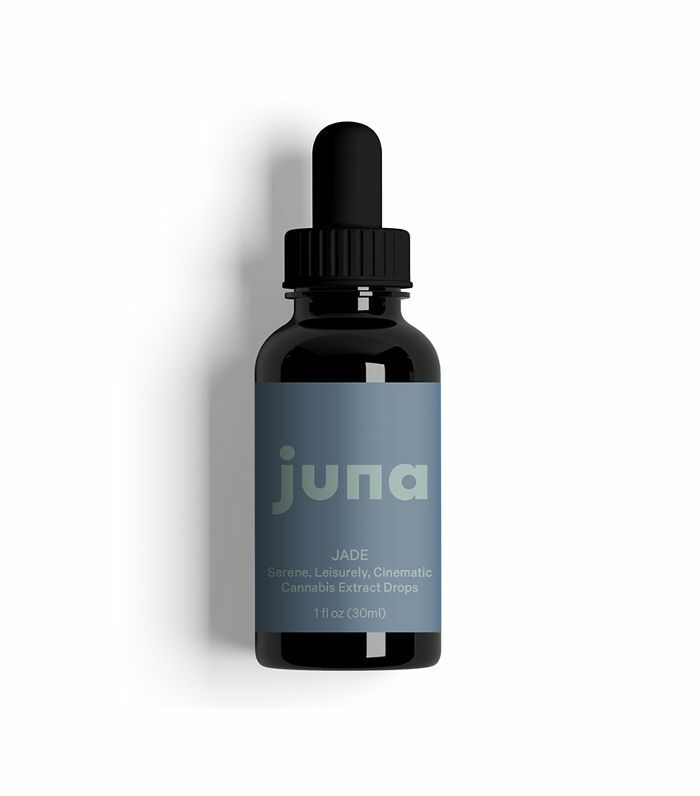 We have been able to take away stigmas and stereotypes and offer formulas such as Jade, a serene, leisurely, cinematic oil in a microdose formula. You don't have to worry about outdated names, such as train wreck or sour diesel, and wonder how much to take, or how you might feel. We took the guessing out and have curated very specific formulas with specific experience profiles—they have a sense of sophistication and savoir-faire. We third-party lab test every batch and offer precise dosing to eliminate any apprehension around consistency. The amazing thing about using cannabis is that whether you take it for wellness or pleasure, you get the benefits of both. What triggered your need for change? The universe was constantly sending people my way asking me to infuse cannabis into chocolate for them. I always said no until my husband reminded me to recognize how many times this opportunity had presented itself and asked why I was so adverse. The truth was that I wasn't adverse necessarily; I just didn't have a connection to the plant. There was a moment when I "gave in" and said, "Okay, the next time I am approached to consult, I'll consider it." As soon as I opened that portal, the conversation pivoted, and I was talking with chemists, doctors, neuroscientists, and farmers and learning so much about this plant. It was actually emotional for me. I was humbled by its intelligence and sophistication. I literally fell in love with the plant. I thought to myself, If I don't know how amazing this plant is, how many of my friends and contemporaries don't know? And it became sort of my purpose to introduce this plant in microdoses from a food, beauty, and wellness perspective. For me there was no choice; it was really a force. The biggest fear was not pursuing. Not listening to my intuition. I was constantly working from a place of what I thought I should do to grow in my career versus what I had the desire to do. Because cannabis has just been legalized, I live in uncharted territory. I truly get to create the path I walk and be an influencer and an educator for the plant. It's an amazing perspective. When I look back on everything I have taken part of in my life, and all the people I have encountered along the way, I realize they have all lead me to this moment in time. The dots really do all connect. What advice do you have for other women who want to take a leap but fear the change? Fear is usually the unknown and magic lives in the unknown. Believe in yourself and all the energy that surrounds you—there are only experiences to be gained. Cannabis is a female plant and has an affinity for women like nothing I have ever experienced before. There is still so much mystery to uncover.